A National Trust for Scotland (NTS) survey failed to find any ptarmigan on Goatfell and the Arran mountains - its most southerly outpost. This has prompted fears that the bird is no longer breeding there. 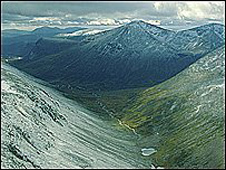 The conservation charity studied areas on its mountainous estates of Goatfell, Ben Lomond, Ben Lawers and Mar Lodge. 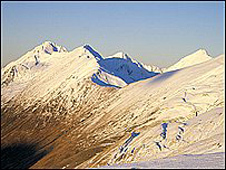 The work was carried out throughout 2008, with some specialist advice from the British Trust for Ornithology (BTO), to establish the population patterns of ptarmigan (Lagopus mutus), an important montane game bird of the Scottish Highlands. Worryingly, there were no signs of breeding ptarmigan on Arran during the course of intensive surveys, sometimes involving up to 15 conservation experts and volunteers. The ptarmigan population on Arran has fluctuated in the past. A survey in 1981 confirmed 28 birds, however, information from the late 1960s suggested a similar situation to 2008 - if the birds are present at all, there are very few of them. The findings suggest that Ben Lomond could possibly now host the most southerly breeding population in Scotland. Mr Lindsay Mackinlay, nature adviser at the NTS, said: "Ptarmigan were found to be breeding on most of our mountains, which is good news. "However, on Arran, very intensive survey work, sometimes with dogs, found no live bird sightings. "The public have reported the odd sighting so we know they are still on Arran, but whether they bred in 2008 is another matter. "This is a marked change from 1981, when 28 birds, including chicks, were seen in one season. "Ben Lomond and Goatfell are excellent places to see if changing weather patterns will affect the ptarmigan. "If predictions about climate change are correct, it is possible that the birds may disappear from Ben Lomond over the coming years." Ptarmigan blend so easily into their mountainous background and with their seasonally changing plumage are hard to spot but are frequently seen by hill-walkers on mountain tops and ridges. They look very similar to red grouse but are usually only seen above 700m on the southern Scottish mountains. They measure around 35cm from bill to tail. In winter, their plumage is mostly white, in spring they are white and grey and in summer they become greyer with darker blotches. The under-body remains mostly white all year round. There is concern over the long-term fate of the ptarmigan population in many upland locations due to the possible effects of climate change and changes in land management. This has led the NTS to seriously consider a long term-plan to closely monitor the ptarmigan and other upland birds on its mountain properties. The reasons for the changes will be the subject of further monitoring and examination by the NTS, and conservation experts are working with the BTO to develop the best methods for doing this important work. Lindsay Mackinlay explained: "We know that ptarmigan populations can be cyclical, but sightings of this hardy bird have been few and far between on Arran, and especially Goatfell, for a number of years now. "This change could be down to a number of factors - it could be part of a long-term natural cycle and we're in a trough at the moment. "Or it could be something more serious, relating to the health of the mountains or even a changing climate. We need to do more work on Arran to understand what is going on." 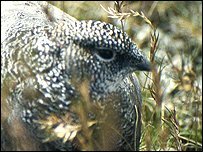 Mr Mackinlay is keen to engage with public assistance in their monitoring plans and is hopeful that more birds will be seen on Arran in the future. "We would ask anyone walking on Arran, Ben Lomond or any of the NTS' mountains to get in touch with us this year if you do see ptarmigan. "Such information is essential if we are to get to grips with what is going on with our ptarmigan." Anyone interested in assisting with future surveys should contact Lindsay Mackinlay at the National Trust for Scotland, Wemyss House, 28 Charlotte Square, Edinburgh, or e-mail lmackinlay@nts.org.uk.